The great American author, John Steinbeck, called Route 66 “The Mother Road” in his book ‘The Grapes of Wrath’. Route 66 ran from Chicago to Los Angeles. I became interested because the house where I grew up was about 50 feet from the Mother Road. I could look out my bedroom window, and watch the traffic go by. In the summer, when the windows were open, this was the music I went to sleep by. There’s a bunch of great links about Route 66. 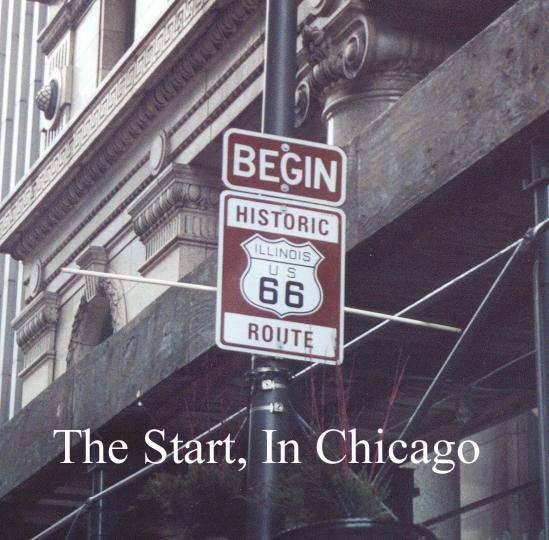 A good start is the Route 66 Historical Society. 2001 was the 75th anniversary of the great road. I finally convinced my wife to make the trip (I’d been trying for several years) so we made our plans. First off, Route 66 needs to be traveled east to west. There are a lot of guidebooks that can guide you on your way, and point out things to see. Since we live in St. Louis, we drove to Chicago and spent a weekend there (nice city, lots to do). Then we picked up Route 66 in downtown Chicago (left), and headed south. The old road exists for about 1/3 of the trip. The rest is under interstate 55 and other roads. Next weekend, we picked up where we left off in St. Louis, and headed west. We took 3 weeks out and back. This included several side trips to see relatives, National Parks etc. Route 66 is 2448 miles long. Route 66 was commissioned in 1926, picking up as many as possible bits and pieces of existing road. Route 66 crosses 8 states and 3 time zones. 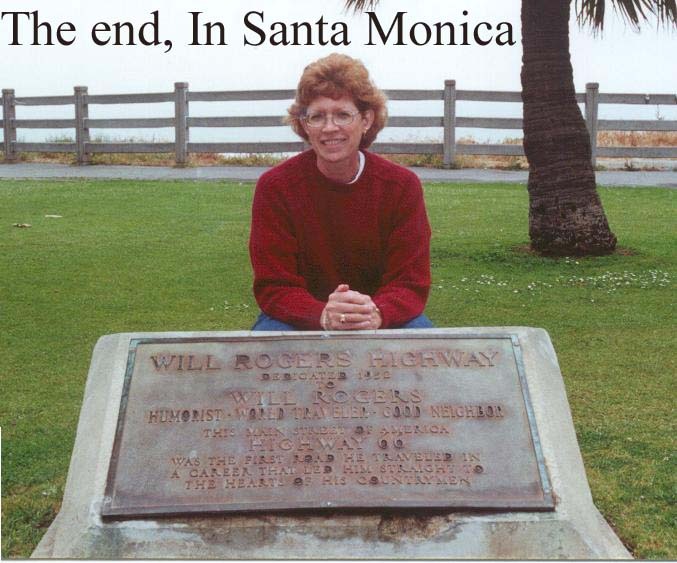 Route 66 starts in Chicago, and ends in L.A. (Santa Monica). Route 66 is also know as “The Mother Road”, “The Main Street of America” and “The Will Rogers Highway”. There’s a bunch of links for the Mother Road. A good place to start is the Route 66 Historical Society.